Through the two-stroke piston to complete a job as two-stroke cycle diesel engine, the engine crankshaft to complete a cycle of work just turn around, compared with four-stroke diesel engine, it increases as a function of force, in terms of structure and working principle There are also quite different. Two-stroke diesel engine with four-stroke diesel engines the same basic structure, the main differences in the gas distribution sector. 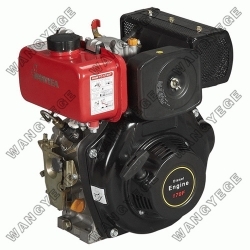 Two red Intake valve diesel engine is no way, and some did not even exhaust valve, but the lower part of the cylinder and exhaust scavenging port opening mouth; Or set scavenging port and the exhaust valve body. And specifically to set up a sweep by the moving parts driven by air pressure pump and storage The sweep gas tank, a piston and with the completion of air intake valve, thus simplifying the engine structure. Rotor driven by a diesel engine. Inhalation of air from the pump suction, discharge by the compressed, stored in a large volume of Sweep gas tank, and in which to maintain a certain pressure. Now attempt to illustrate the work of two-stroke diesel engine. Downward movement of foreign for power. The piston down until the exhaust port open (in this case the crank in position, then gas Expansion for the power end, a large number of cylinder pressure on their own free exhaust gas, discharged from the exhaust port to the exhaust pipe.When the cylinder pressure to near sweep gas pressure (usually sweep gas tank in the sweep gas pressure of 12, the piston down the scavenging port 3 open (at this time point 4 in the position of the crank, scavenging air into the cylinder, Within the cylinder while the exhaust out of the cylinder through the exhaust port. Pistons run to the next stop point, the end of the stroke, but the scavengingProcess continues until the next exhaust stroke off (this time in the position until the crank.